The Ayes and Nays of Government Captioning – The Captioning Group Inc. So begins another session of the British Columbia Legislature’s 41st sitting on June 22, 2017. 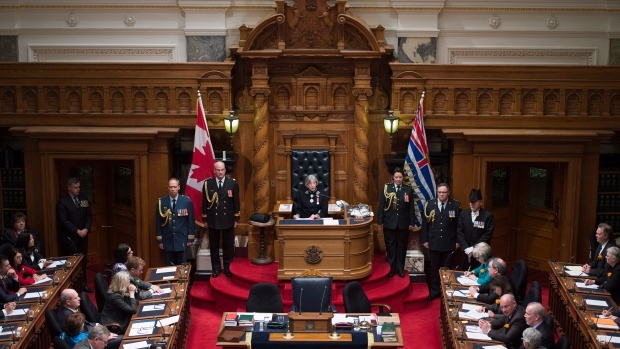 This setting is familiar to me–I’ve been a realtime captioner for The Captioning Group on their legislature for B.C. for over nine years now. Before that, I captioned the U.S. House of Representatives for four years for a U.S. captioning company. I remember the first time I was approached to be part of the team to caption the B.C. Legislature in 2008 and how overwhelming it felt. All of the different Ministers and MLAs, territories and provinces, plus the Speaker and the various assigned positions to I.D. It was a lot to take in! I reminded myself that I had done this job in the U.S. for many years, so just relax and get busy preparing. Preparation. I knew then and I always remember now that whether it’s a Legislature program, a news program or a sporting event, that preparation is the key to SUCCESS. Forget that you have to tune out all the heckling – wow, that is different than the U.S. system — but it’s better than the House of Commons I’ve listened to in the U.K.! 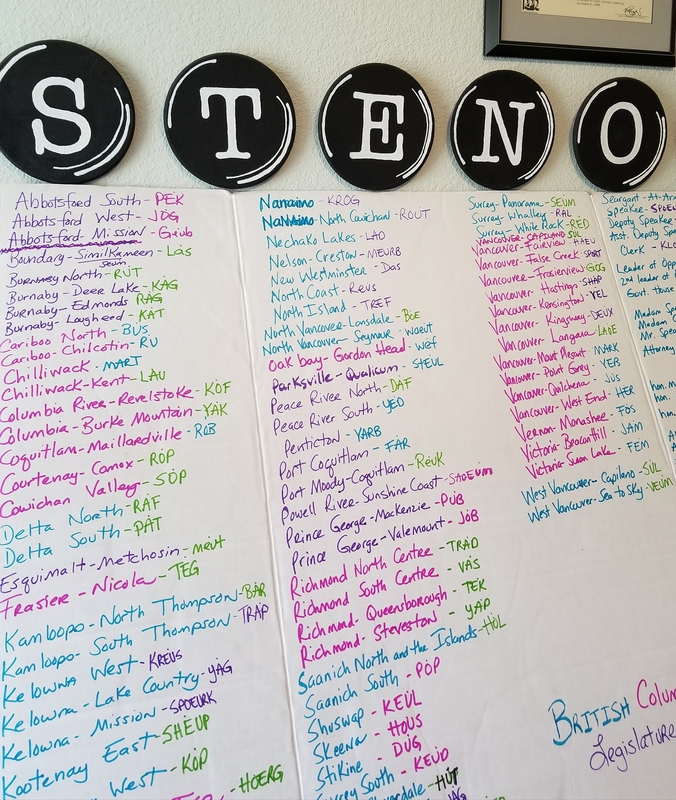 I knew I needed to have a very large, easy-to-read board (see the photo at the beginning of this article) so that I could create my fast speaker identifications so I could be assured I could keep up with the fast-talking speed of some Ministers and members. The board would also help me remember all the I.D.s of the Speakers, the Clerk, and others stepping in as Government House Leaders and such. >> Clerk: INTRODUCTION OF BILLS. >> Hon. Michael de Jong Q.C. I.D. so you can keep moving forward. Yes, I quickly learned Ministers step into roles when needed. There are also Deputy Speakers and Assistant Deputy Speakers, the Leader of the Official Opposition, and the Opposition House Leader (those are two different people, by the way!). Then when the committees begin, we add in Chair: as an alternative I.D. These tricky posts and designations are what would attempt to trip me up at first so I focused on memorizing which Minister or MLA was in each position knowing that once I had no hesitation on what correct I.D. to put out that I would be able to free my mind to focus on just “writing what they are saying,” which is kind of important in realtime captioning, LOL! And, let me tell you, there is a LOT of talking! A LOT of talking! Plus, there can be a lot of passion in viewpoints which usually means a pickup in speed too. Whether it’s a question to the premier or a passionate speech on various subjects such as kids in care, cost and availability of healthcare services and practitioners, or the need for more infrastructure for provinces and territories, almost all the members of the opposition will speak within a week’s worth of sessions to the government. Cue the heckles from both sides, too! I have become adept at filtering the hecklers out of my focus so that I can continue on as much as possible with the speech at hand. Some days you have the focus and flow for long speeches, and other days it’s a strenuous mental and physical workout. I sometimes dream of commercial breaks when captioning the Legislature! It doesn’t take long to realize which member or Minister is a dream to caption – nice and even tones, an even speed. Then, there are those who cause you to wince when you hear them called to speak. As is life, sometimes there are 500 wpm speakers or those who mumble. This is true in many cases with captioning of any program and in court reporting in general, but those who mumble or speak without punctuation starts and stops mean you have to mentally let it fly through your mind to your fingers. I often make a “game” of it by trying to see how long I can push myself to hit that newly attained words per minute without an error in translation. It helps to set little goals to get through long stretches, in my view. This just-finished mini-session of the 41st Parliament was the most interesting I can remember. After a close election, the ruling Liberals under Premier Christy Clark did not hold a majority with 43 seats. The Opposition NDP government had 41 seats and the Greens went from one seat to three. The NDP and Greens joined political forces, and after a week of impassioned speeches from both the Liberals and the NDP and Greens, a no-confidence vote was taken and the NDP/Greens combined took over as majority in the House at 44 seats. Thus, there was the decision of either the Lieutenant Governor allowing another election to be called, as the Liberals wanted, or allowing the NDP to overtake the Liberals and to become the new majority government. The Lieutenant-Governor chose to allow John Horgan, the Official Leader of the Opposition, to become the premier-designate. The 41st session then adjourned until the Fall, we’re assuming. Soon I will be reworking my boards again to now have the NDP as the ruling government, so there’s a bit of work ahead once all the Ministers are in place. There is always new work to be done with this work! I am so thankful that I have and have had the pleasure to caption with other great captioners over the years. It’s great to be able to commiserate over the ins and outs of captioning – whether it’s daily or over years of trading back and forth with them. We help to keep each other sane by sharing a joke on the tough days of something we may have captioned, and on the good days, you always appreciate knowing that you are now finished but great captions continue with your colleague. 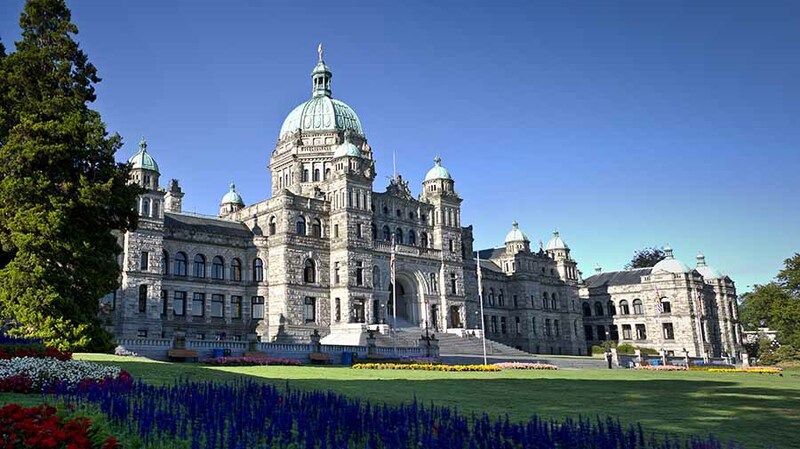 Post-script – thank you to Michelle and Carolyn who trained me when I began captioning the BC Legislature at TCG, and to my colleagues Sue Perrish, Karen Prokopishin, and my buddy-in-the-trenches, Marcy Reed. This article was written by Susan Hahaj, one of TCG’s most experienced and qualified broadcast captioners.